Fair question. In fact its a question that gets to the heart of this blog and its 112 posts! It isn’t trivial to plan and pull off a working vacation–it takes time to apply for a sabbatical or leave of absence; it takes time to rent a home; it takes time to find housing and transportation in the host country; it takes time to plan activities and schooling for young children. It is far easier to simply open a cold beer and enjoy a Twins game. 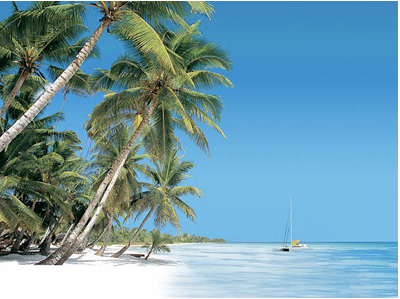 Therefore, to answer this straightforward question, let’s talk a bit about the whys and wherefores of working vacations. When we were teens or twenty-somethings many of us relished the idea of living, not just traveling, abroad. We dreamed of heading off to Europe after graduation (and a good number actually did) to experience a new culture, make new friends, and mature as young adults and global citizens. We were not interested in a one week “Highlights Tour” or dashing past a few major tourist attractions. Instead, we wanted to settle down, learn the language, find employment, and become part of the local community, even if only for a few months. Why should this love of cultural adventure fade as we grow older? Why should we abandon our idealism and wanderlust because we have added a few years, a few pounds, and a few dependents? Why aren’t we still as passionate about the joy and excitement that accrues from living and working abroad? When you live in a community, rather than drop in for a few days, you have time to meet neighbors, attend social, cultural, and religious events, and participate in local activities. Everyday tasks like shopping, laundry, even getting a haircut, require you to learn about the neighborhood and the people who live and work there. A short-term working vacation affords you time to take those off-the-beaten-path excursions not possible in the jam-packed schedule of a one- or two-week family holiday. You learn about a culture not by observing it from a distance but by becoming part of it. And, best of all, short-term overseas work is a wonderful way to invigorate one’s own life which can, no matter how much you love what you do, slip into a pattern of repetition and boredom–go to work, eat dinner, watch TV, fall asleep. As the Roman philosopher Seneca said “Travel and change of place impart new vigor to the mind.” For many skilled professionals this type of transformative work experience is far more rewarding than a Caribbean cruise or a couple of weeks at a B&B. A short-term working vacation is a wonderful way to combine the relaxation of a holiday with the intellectual growth and excitement of interacting with and learning from local residents and professionals. And all this on the other guy’s dime! Imagine trying to describe the smell of a fresh-cut rose or the taste of a superb French meal–words alone cannot do it justice. This is the problem writing about Thaipusam, a Hindu festival celebrating the birth of Lord Subramaniam. The holiday is observed throughout the Hindu world but nowhere with more exuberance than Kuala Lumpur. About 1.5 million people attend the day-long festivities, which occur in late January or early February. Everyone is welcome to join in although, because of the huge throngs, you may wish to reconsider if you have enochlophobia–fear of crowds. The celebration lasts 24 hours but due to the heat and humidity most tourists attend at night when the weather is less oppressive. My wife and I boarded a bus at 11:30 PM for our trip to the Batu Caves, the site of the festival, about 8 miles from the city center. Because of the crowds the trip takes over an hour, and we must walk the last half-mile as the vehicle can’t navigate the throngs of revelers, penitents, and sightseers. As we step off the bus everyone’s reaction is identical: “What in God’s name did I get myself into!” There are people everywhere, deafening music, strange smells, loud chanting, lights, noise, fireworks–a combination state fair, tent revival meeting, and hard rock mosh pit. One man likens it to Dante’s seventh ring of Hell. The driver wishes us good luck and reminds us the bus returns at 5:00 AM sharp so leave enough time for the Herculean effort that will be required to get back to the parking lot. Thaipusam is a time for the devout to cleanse themselves of sin. Pilgrims wash themselves in the nearby river and cut off their hair at one of the dozens of “barber shops” lining the walkway to the festival. The newly shaven head is then smeared with sandalwood, a pale yellow powder holy to Hindus. After the ritual bath and haircut the penitents put themselves into a trance-like state. Through prayer, as well as rhythmic music, drumming, and chanting, they become hypnotic, almost catatonic, and unconsciously bump into people around them. Once entranced they are pierced with skewers, knives, and other sharp objects–mostly through their cheeks and lips. 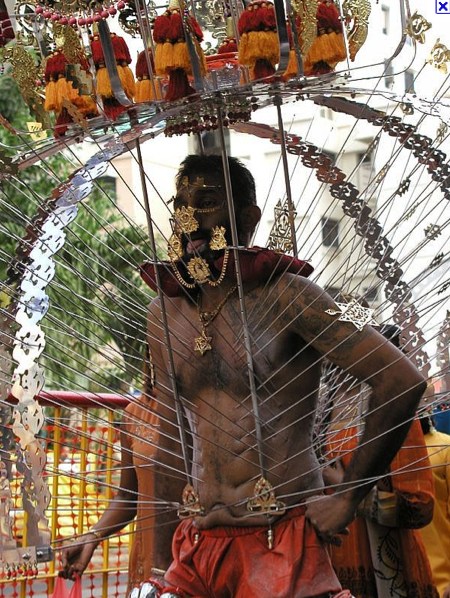 More intense participants put hooks through the skin on their stomach, tie them to ropes, and drag a ceremonial chariot, called a kavadi, using only their flesh. The kavadi is a wooden frame carrying incense, fruit, feathers, milk, honey, and other gifts for Lord Subramaniam. The penitent drags this chariot through the madding crowd screaming and chanting prayers, all the while helped along by friends should he fall down or faint from exhaustion, ecstasy, or pain. Within the site are tens of thousands of worshippers, hundreds of thousands of helpers/musicians/dancers, and countless sightseers, touts, vendors, and assorted hangers-on taking in the multitudinous sounds, sights, and smells. There is also a carnival area where thousands of vendors set up stalls selling food and Hindu “tchotkes,” such as sandalwood and incense, while fortune tellers are offering to predict your future. The place where pilgrims bring their gifts, Cathedral Cave Temple, is at the top of a steep hill. 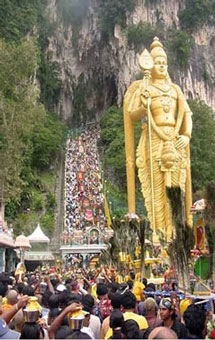 An enormous gilded staircase (40 feet wide, 272 steps) snakes up the mountain to reach the temple and its gilded statue of Lord Subramanian. Tens of thousands of people, carrying torches to light the way, drag their chariots up the many steps. Tourists can join the procession, but we decline as we can’t face yet another teeming throng. Instead, we opt to watch the torchlight parade of pilgrims and marvel at this awe-inspiring demonstration of religious fervor. I also began plotting our strategy for returning to the bus–a non-trivial operation since pilgrims and visitors are still streaming in. We return to our apartment at 6:30 AM, so wound up in the evening’s experiences that sleep is impossible. I also smell (reek is a better word) of incense, sandalwood, curry, sweat, and mud, and stand under a hot shower for a very long time. I am not sure if it is proper to say one has “enjoyed” such an experience, what with the pushing, screaming, heat, and crowds. I can say,however, that I was totally mesmerized, thoroughly awed, and utterly fascinated–an evening unlike anything I have done before or since. I used to believe that driving the Dan Ryan or FDR at rush hour would be the most stressful activities you could undertake. Fuggedaboutit! Nepalese drivers make New York cabbies look like models of decorum. The primary rule of road behavior in Kathmandu is “Blink and die!” Passing on curves and driving on the sidewalk don’t rate a second mention in the litany of traffic sins, while a cow sleeping in the road is not unusual. Turning, passing, stopping, and merging are indicated via honking so you can only imagine the cacophony ringing around you as you drive. As for traffic “infrastructure,” ha. Lane markers—you gotta be kidding me; stop signs—in your dreams; traffic lights—when the messiah comes. The most important infrastructure available to the Nepalese driver is a good bumper and firm seat belts. 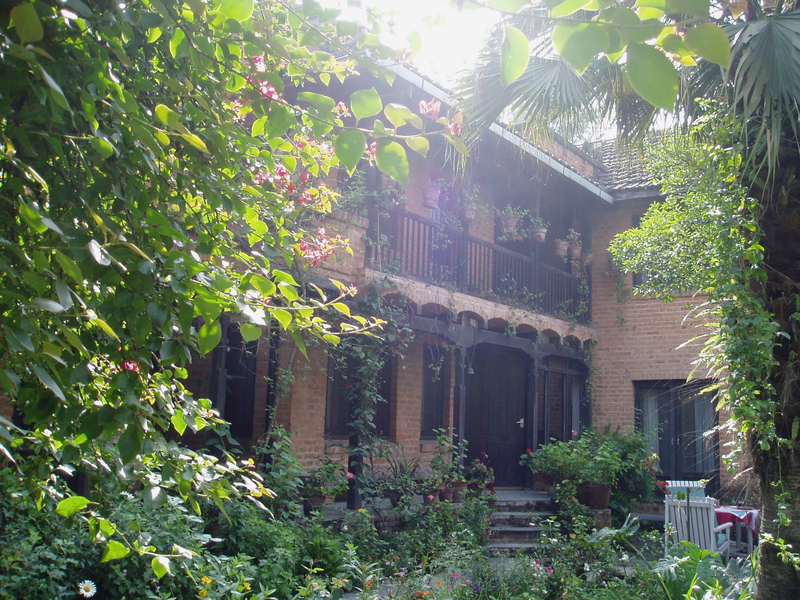 While my wife and I were on a three month working vacation in Nepal I had to travel 30 km (18 miles) to work from our lovely home in Kathmandu (see the photo–and, yes, that was really our home) to the university campus in Dhulikhel high in the foothills of the Himalayas. I had a rental car at my disposal and thought it would be a quick trip since the two cities are connected by the Arneko Highway, the main East-West road link for the entire nation. Unfortunately, this lifeline of commerce and transportation is not quite as wide as the side street in front of my home and nowhere near as well maintained! The craziness I saw every morning and evening was made even worse by the range of vehicles using the road. The Arneko Highway contains an equal mix of cars, overloaded trucks straining to reach 10 mph, buses spewing coal black exhaust, motorcycles, mopeds, bicycles, pedestrians, cows, and (yes) lawnmowers. This last one confused me, since I didn’t think lawn maintenance was a major concern of the Nepalese. It turns out used riding lawnmowers are less expensive than mopeds and, as long as you don’t mind the leisurely 4-5 mph, a cheap form of motorized transport!